"I have to try. Everyone will die otherwise!" "Oh, yeah, that's a good point." 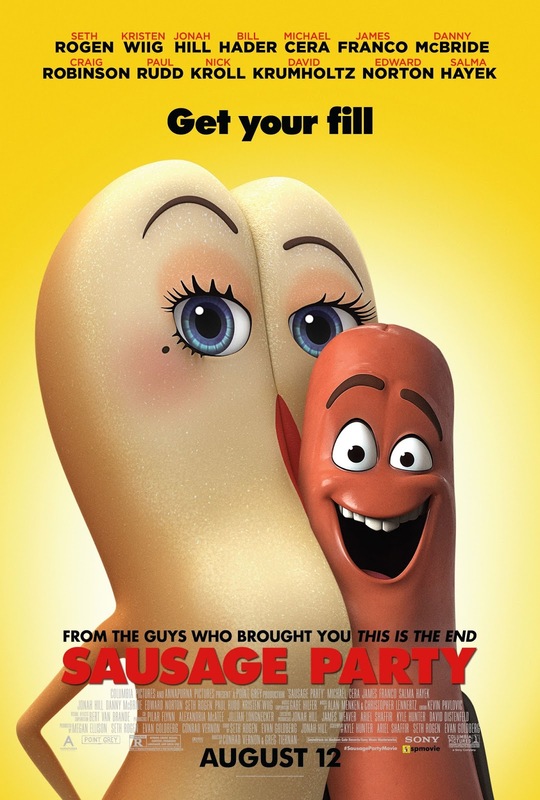 That's part of a hilarious eye-opening conversation between Seth Rogen & Bill Hader in Sausage Party, the year's funniest & raunchiest film, & the funniest animated film ever made. Rogen voices Frank, a sausage in a package at a supermarket called Shopwell's, along with Carl (voiced by Jonah Hill), Barry (voiced by Michael Cera), a deformed sausage, & Troy (voiced by Anders Holm). All the food wants to do is be chosen by humans & sent into "The Great Beyond." Frank especially wants to be in The Great Beyond with his girlfriend, Brenda (voiced by Kristen Wiig), a hot dog bun. Both of their packages are chosen by a woman aptly named Camille Toh (voiced by Lauren Miller), who also chooses a Middle Eastern lavash named Kareem-Abdul Lavash (voiced by David Krumholtz), a Jewish bagel named Sammy Bagel Jr. (voiced by Edward Norton), & a douche simply named Douche (voiced by Nick Kroll), but not before a jar of Honey Mustard (voiced by Danny McBride) warns them that The Great Beyond is not what it seems. Eventually, in a cart collision, Frank, Brenda & Douche fall out of the cart, & Honey Mustard kills himself. Douche's nozzle is damaged, blaming Frank, & swearing revenge after being thrown away by Darren (voiced by Paul Rudd), a nerdy clerk. Frank eventually learns the truth about The Great Beyond from Firewater (voiced by Bill Hader), a Native American bottle of liquor, & Mr. Grits (voiced by Craig Robinson), a box of grits. Frank learns that humans will eat them. Frank, Brenda, Kareem, & Sammy try to find their way back, encountering a lesbian taco named Teresa Del Taco (voiced by Salma Hayek) along the way, while trying to avoid Douche, while Barry encounters a Druggie (voiced by James Franco) & tries to make it back to Shopwell's, & Frank, now knowing the full truth, must tell everyone, even though no one will believe him. The voice cast is excellent. The direction from Conrad Vernon & Greg Tiernan is great, along with the screenplay from Rogen, Hill, Evan Goldberg, Kyle Hunter & Ariel Shaffir, which is also gleefully profane. But the last 10 minutes of the film are shockingly bizarre, & will either make you laugh, make you feel repulsed, or both. This is a delightfully profane parody of Disney & Pixar films.